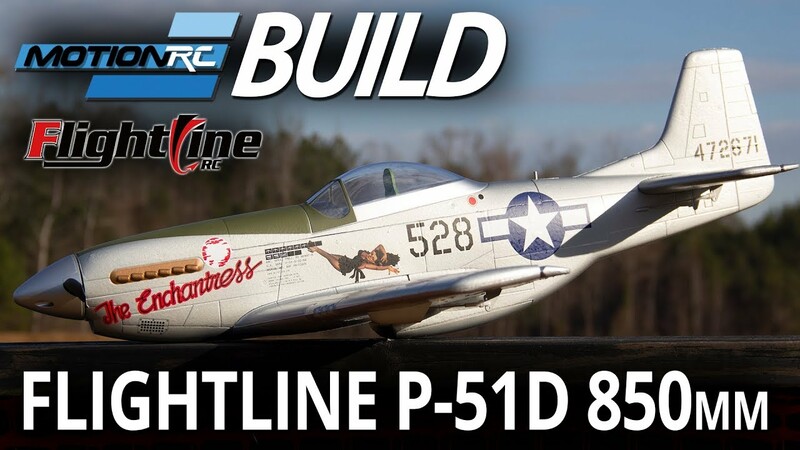 Introducing the New 850mm P-51D Mustang PNP from FlightLine! 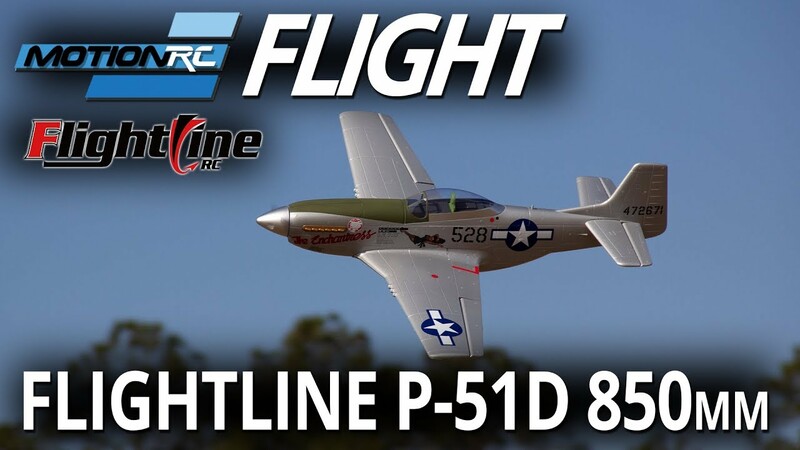 FlightLine and Motion RC have re-imagined the classic P-51D Mustang for 2019 in a beginner-friendly format with accurate styling, gyro-readiness, low operating cost and high fun factor in an easily transportable size! This Mustang features a versatile power system that can use either a 3S or 4S flight battery without needing to change the propeller or ESC. The large battery bay accommodates a wide range of battery sizes, from 3S 1600mAh to 4S 2600mAh. Transition from a 30-60mph 3S Trainer to an 80+mph 4S Racer with a simple five-second battery change! Optimized as both a slow speed 3S warbird parkflyer and a 4S sportscale racer, the FlightLine Pocket Warbird series P-51D Mustang can also fit a gyro-stabilized receiver such as the Admiral RX600SP 6-Channel DSMX™ Compatible Receiver with Stability Plus Gyro. Easy hand launches are accomplished either overhand or underhand, and balanced wing loading provides precise handling and steady landing characteristics. Say goodbye to precarious nail-biting hand launches - - this Mustang is a breeze to launch with moderate throttle and a firm toss. Separating itself from previous generations of parkflyer warbirds in the sub-900mm class, several design elements increase this Mustang's durability including a long plywood battery plate, reinforced motor firewall, shatter-resistant two-blade propeller, one-piece wing with carbon spar, servo horn protectors, and plastic sheathed underside fuselage to resist scuffs during landing. The overall result is a balanced model that "flies on rails" like a larger aircraft instead of being "pushed around" like a toy. For additional control precision, pilots can also install a 9g rudder servo inside the fuselage and use the pre-molded passageway to guide a control rod rearward toward the rudder hinge itself. The model can be raced within smaller flying fields areas with a lightweight 3S 1600 battery, or in larger areas with a heavier and more powerful 4S 2600. We recommend the 3S 2200mAh or 4S 2200mAh as an ideal balance between flight duration, top speed, vertical performance, and ease of launch/landing. 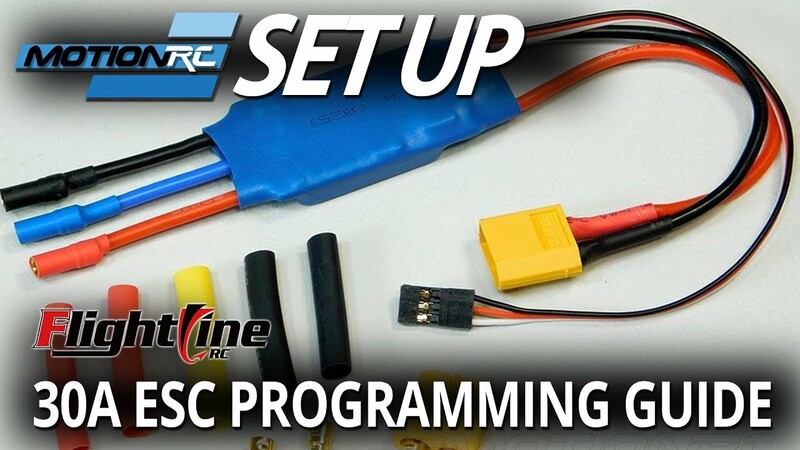 Backed by Motion RC's world-class service and a host of spare parts, race your Mustang with confidence! This is the first P-51 model I have ever bought. Growing up around a bunch or Air Racers I was sick of em. . But I do love park flyers, and this looks like a nice one. You simply can't beat the deal here when you count the free shipping. +1 Motion RC. Argh, can't believe I bought a Mustang. Like the 64mm 4S HP Stinger, these could be a lot of fun for club racing events. Odd to see a Flightline plane with a XT60 connector on it. I have two of the old Parkzone P-51D’s which are slightly bigger at 39 inch wingspan. Great fun! This is a definite niche that has a need to be filled as there always seems to be room to toss a couple in the load when heading to the local park or field to fly. I’m glad to see it! Count me in. I tend to fall in the "Bigger Is Better" snobby scale category but I gotta say, there's a real fun factor with these "Toss and Boss" planes. Sometimes it would be fun just to throw a few in the back and head out and go yank and bank to your heart's delight. I will definitely be picking up one of these with a 4S. Are the DECALS (1) STCK ON type or (2) WATER SLIDE ON type??? Are different sets of decals available? For example: "Big Beautiful Doll" etc...? The decals are waterslide. We have no other decal sets aside from the 2 in the box, but https://callie-graphics.com/ is where you can go for any livery you can imagine. She'll customize and re-size anything you wish. Another vote for Callie! She is great. So there is no rudder servo or linkage? What about: is rudder hinged already? and, is there a control horn on the rudder? I'd almost certainly be adding a rudder servo. Is the rudder pre-hinged? Can I just cut out some foam and get it moving easily? How about the pushrods and pushrod tube? Is there a "kit" for adding the rudder, or are we on our own fabbing those parts? How hard would it be to mod the spinner and drop in a more scale 4-blade prop? I fly all my 800's on 3 or 4 blade props, and have become pretty successful at plopping them in when landing. I seldom break a prop anymore, and would love to try one. Even if I do end up breaking a prop, it'd be pretty cheap to replace at this size. Flapperons help a ton to slow them down too. Dare I hope for a P-38 in this size? Gawd, I'd be absolutely giddy if I could buy a Lightning this size! Just placed my order and will try my first Admiral 6 channel stabilized receiver for this little bird. Going with a 1800 4s Admiral battery.... Going to Callie's graphics now to order some livery!!! Regarding the rudder. It is not pre-hinged and there are no control horns attached to it BUT, see the attached pics, there is a pre-cut spot in the tray for a 9g servo, and a tube molded in the back of the fuse for a control rod. It will pop out in the perfect spot on the fuse to add your rudder. ORDERED. The wife and I are moving next month and there are a few soccer fields 4 mins away from the new place. This is a great plane at the perfect time!!! Will definitely add the rudder but I VERY much appreciate FL saving us some money by leaving it out of the production model while providing an easy mod to add.